Home » Environment » Pets & Animals » Why should we care if our crocodiles are sick? Why should we care if our crocodiles are sick? A few weeks ago The San Pedro Sun printed an article titled, “Crocodile health on Ambergris Caye is alarming says initial research findings”. My bets are that many readers never gave the article a second thought…after all we have far greater problems to concern ourselves with, right? With rampant, unregulated growth on the island, inadequate infrastructure, land filled with polluting trash and a reef that shows more signs of bleaching each day, a sick crocodile or two is the least of our worries. Interestingly enough, many of those ‘greater problems’ are directly related to the health of our resident crocodiles, and believe me if these prehistoric creatures have survived this planet longer than dinosaurs and are NOW getting sick, we most definitely DO have a problem. You don’t have to like crocodiles to be concerned, but you’d better be alarmed about WHY these resilient reptiles are displaying health abnormalities. The health afflictions the crocodiles around Ambergris Caye are demonstrating are a direct result of an unhealthy environment, with severely polluted waters being at the top of the list. 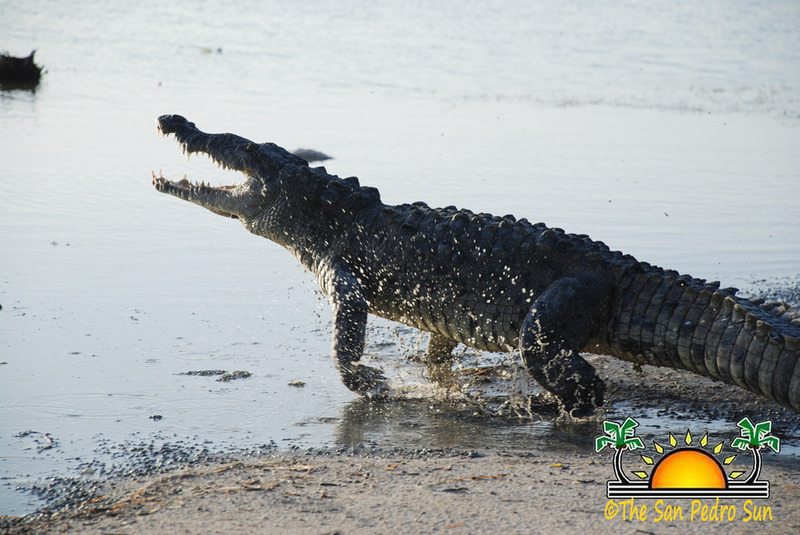 Dr. Marisa Tellez, who along with the American Crocodile Education Sanctuary (ACES) has been studying crocodile health on Ambergris Caye for several years, stated that crocodilians have been one of the longest surviving creatures on the planet. They are known to have one of the most resistant immune systems and can live and survive healthily in the worst environmental conditions. But past sample studies have shown that the crocodiles on Ambergris Caye are not as healthy as they appear. Cherie Chenot-Rose, biologist for ACES has also observed several crocodiles in the area with a variety of abnormalities. From no teeth, to tumors, skin diseases, stunted growth, deformities and low body weight, many of the crocodiles they have examined display troubling health issues. As residents on Ambergris Caye we need to consider crocodiles as the thermometers of our environmental health. When a child is not feeling well one of the first things we do is take his temperature. If he is running a fever we know his body is fighting an infection. We wonder, what made him sick? Was it something he ate or drank? These are the same kind of questions we need to be asking when our crocodiles ‘run a fever’. If something in our environment is making them sick, these creatures, who are regarded to have one of the most resilient immune systems in the world, we'd best regard this as a wakeup call. Dr. Tellez observed that afflicted crocodiles, crabs and fish were concentrated in the more developed and urbanized areas of the island. These areas, specifically San Mateo and San Pedrito, were all constructed on wetlands that were originally filled with garbage. These areas, which are also without proper sewer systems, contaminate the surrounding waters with raw sewage, turning it into a putrid stew. It is easy to understand how crocodiles and marine life that live in the area are unhealthy. If these creatures blessed with a super immune system are falling ill, the conditions must be extremely toxic. These same toxic waters ultimately infiltrate the marine system and damage our cherished reef and mangrove systems as well. Our crocodile thermometers are telling us the island is running a fever, and if we don't get serious about fixing the things that are making them sick, we will be the next ones in line.